← Vote for The Wandering Sheppard ~ Best Local Food Truck Blog! This week’s picture is a familiar sight for me. It is the pedestrian bridge that links the government buildings of Halifax Mall to a parking garage located across Salisbury Street in downtown Raleigh. 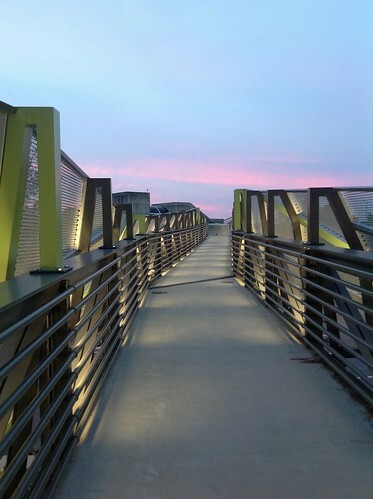 The newly renovated bridge has an interesting modern style and look. It even has small speakers installed the periodically play recordings of bird calls that sound more like howler monkeys. I’ve been told the sounds are used to scare away real birds from perching on the bridge. On the night I snapped this picture the sky was displaying a colorful sunset as I made the short journey to my car.